My mother (Clara Hogan) grew up in Charlottetown, Prince Edward Island, Canada. Her family immigrated to Oregon when she was twelve years old. She never stopped loving or forgot her beloved island and her home near the sea. I have always wanted to see the island and despite my worldly wanderings I had never been to her birthplace. My sister Ananfaye and I decided to take a cruise and spend time in my mother’s neighborhood. 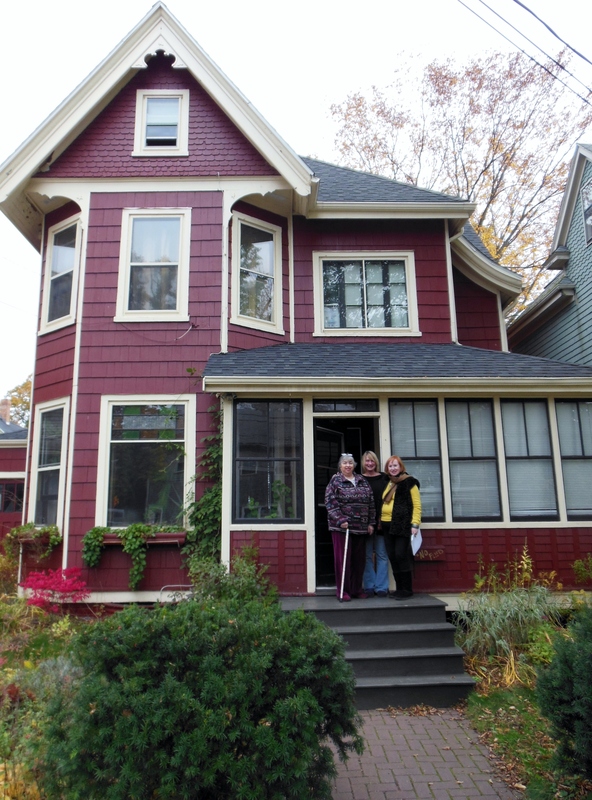 We hired a driver and scoured the area for a glimpse into her life and to see her house at 18 Prince street a house built by my grandfather’s brother Rufus S. Hogan my great uncle. My great grandfather M.P. Hogan and his son Rufus were builders and merchants, but my grandfather whom I barely remember except that he called my mother Cala, not Clara and he took me for walks around the Oregon neighborhood where they lived when I was small. His name was Arthur Edward Hogan and I remember him taking my hand and telling me that he had held my mom’s hand the same way when she was little. He was a lawyer in PEI and graduated from law school at McGill University in Montreal also obtaining an LLM in law. My memory recalls him as being very gentle. My grandmother was Annie Mae Dorsey and I am sure her family lived nearby also on the island. I remember her well with long braids of grey that she let us brush when she undid her hair at night and if we were good we cuddled up with her and slept in her bed with her after grandpa died. My sister and I took turns sleeping with Grandma especially during the war when my dad was overseas and we lived with Grandma Hogan for a time. David our driver took us to 18 Prince street and and he knocked on the door of the residence explaining to the mistress of the house, (Denise) that our mother had lived in the house as a little girl and that our great uncle had built the house. 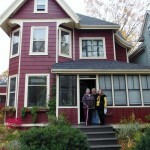 She graciously welcomed us into her house and we viewed the property and back garden. It was barely modernized and everything seemed very old, with lots of wood and carvings above the doorways and a wide wood stairwell. It amused me because although I love old houses and furniture my mother did not care for antiques or anything old as an adult. The visit was an emotional experience that I had not expected and I felt overwhelmed and forgot to take pictures inside the house. Our driver took the picture posted above at the house. Exploring the neighborhood and seeing how close my mom lived to her cousins, aunts, uncles and grandparents made me understand how difficult it must have been for her to leave Canada as a child. My great grandfather M.P. Hogan was a builder and we explored a series of addresses in the historic old town, connected to the family. Hogan built the house at 26 Prince Street and was the owner and occupant in 1887 . My grandfather was born in 1875, so this must have been his childhood home. 93 Weymouth street was my great grandfathers office in the 1920′s but he did not build the structure. He also had an office at 40 lower Water street with a business called The Sash and Door Factory. Great uncle Rufus lived at 18 Water Street in a house he built for himself and his family. It faced the sea overlooking the harbor. He also owned the home at 127 Water street which he built and he had a summer residence at Brighton Shore. M.P. Hogan also built a pair of houses at 137-139 Kent Street in 1886 which were designed by William Harris. The houses stayed in the Hogan family until M.P. sold the property in 1894. There were other homes built by the Hogan men, some now demolished and others still standing. It was easy to imagine my mother walking to school and church at St. Dunstan’s Basilica all within a few blocks of the harbor. With her family nearby and knowing that the house she lived in was built by her uncle must have made her feel secure. It is no wonder that she loved the sea, the beach and made the best clam chowder I have ever eaten. She was the only mom I knew that fried clams with eggs for breakfast at the beach after our early morning clam digs. PEI mussels are world famous today and she would have been so proud of that title. My dad used to visit the Pier in Seattle on Fridays after work to pick up her beloved seafood for our Catholic style family dinner. She loved halibut, crab, shrimp and oysters, and so do I. My mom used to tell us stories of PEI when we were little. She said that the snow piled up so high about the house that to exit in the winter they wore snowshoes and used the attic window to vacate the house. Even today PEI is known for its high drifting snow. She loved her cousins living nearby and she spoke their names often to us all good saints names of course, Michael, Mary, James, John, Caryl, Catherine and Laila. She told us of her tragedy one day while going to school with her friend. They had taken their ice skates and skated along the harbor, which they had been forbidden to do without their older sisters and brothers. My mom’s friend fell through the ice and my mom could not get her out because she was wearing a heavy fur coat and it kept pulling her down into the freezing water. My mother ran for help, but when she returned her dear friend was frozen to death. My mom was inconsolable and I think she told us the story so many times because she needed to relive the horror and put it to rest. 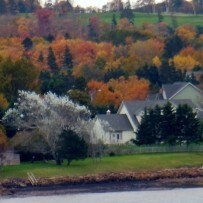 Recently after I came home from PEI I dreamt that my mother’s school chum that drowned in the harbor was named Susan. It was a startling revelation to me because my mother named me Susan as she often told me because she had a childhood friend that she loved and admired and she wanted me to have her name. She used to say that she wanted to be just like her beautiful friend and by naming me after her hoped that I would be like her. I also recalled that she had never mentioned the name of her friend that drowned. My father always wanted to name his five girls after his sisters he loved so much but he said there was never a choice about me being Susan. It made me recall an incident when I was in fourth grade and my father was promoted to a new job with United States Steel Co. and we moved to Seattle from Portland. When we left, the day we took the train to Seattle, we drove to Grandma Hogan’s house so my mom could say goodbye to her mother and some of her sisters who were there. As we left my mother began to cry softly then it became louder and sobs rocked her body until she began to wail. At the time I did not really understand it because I was excited about my new life in Seattle. I felt sad and we all stayed very quiet until we were aboard the train. My father tried to console her but it was useless. This trip to PEI helped me understand that the terror she felt that day in leaving Portland triggered all the losses of her life. Her dear friend lost in the frozen waters of the harbor when she was ten, then again at twelve mourning the loss of home, of place, of belonging when she left Canada and her extended family. The tragic loss of her older sister Ella in a car crash after the family moved to Oregon. I finally understood that the move from Oregon to Washington must have devasted her as she moved again from all that she loved. After her tragic death I found a gilded maple leaf brooch, the symbol of Canada, a piece of jewelry amongst her belongings. I had never seen it before and to my knowledge she had never worn it. I kept it. At the end of our day in PEI we had planned to shop and visit a few galleries. 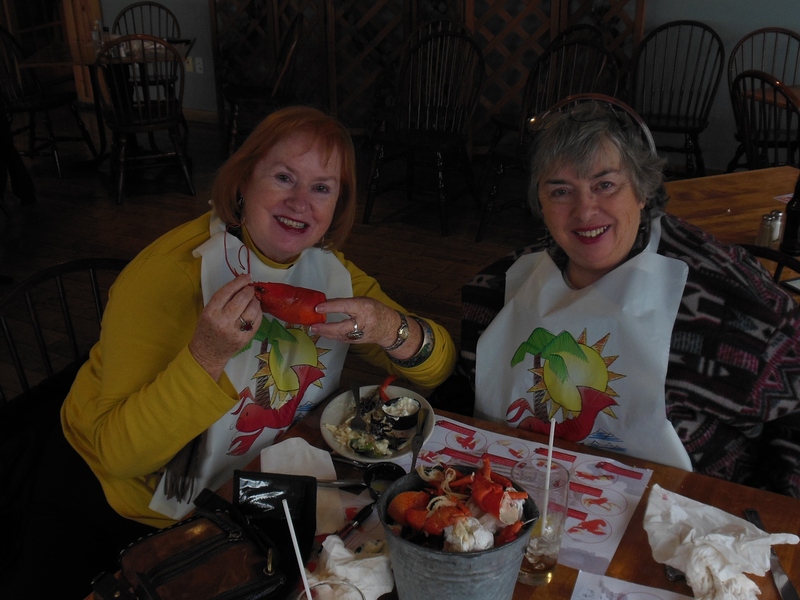 But the magical beauty of PEI consumed us and as we sat with David at “Lobster on the Wharf” at 2 Prince Street overlooking the harbor a few blocks from our mom’s childhood home, we forgot about shopping and enjoyed the moment! I miss you mom, everyday of my life. I forgive you. 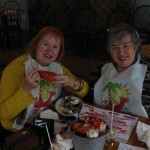 Hi cousin Susan- I appreciate your memories of PEI and your mother. Hi Tom, haven’t been keeping up my blog but need to get back into it. Hope you and your family are all well and happy. My sister Gloria, her husband, Howard and daughter, Rachel went again to PEI in 2016 to the Hogan Family reunion and it was wonderful to meet so many relatives. There is a closed group on Facebook called “Hogan Family Reunion”, where all the pics from the reunion are posted and information about the family. We did a meet and greet at MP Hogan’s former home in Charlottetown, which has been restored to the era’s vintage. Our mom’s house was right next door to MP’s. A group also went to Brule NS to visit the Hogan cemetery where the Hogan’s first landed. We mostly stayed in town and hung out with all our new found relatives. Charlottetown is certainly a beautiful spot as is the whole of PEI.